The Island of Jura, is one of Scotland’s last wilderness. For those how are not familiar with it, Jura can be found North east of the more famous Isle of Islay. The famous “sound of Islay” or Coal Ila , separates those two islands. Despite the fact that it’s pretty much the same size as Islay, Jura’s population is only 200, and greatly outnumbered by the number of deer who live on the island (5,500). No wonder it’s name is based on the Norse “Island of the Deer”. There is only one distillery operating on the island, which is called (not very Surprisingly) “Isle of Jura”. 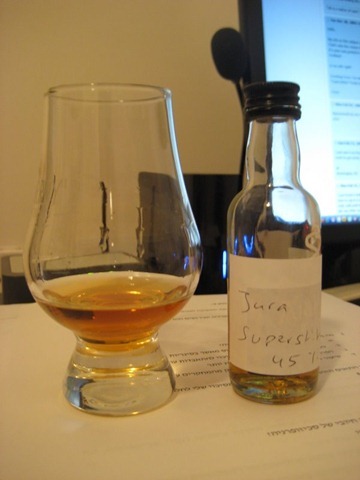 The Jura distillery offers a line of single malts , starting a the 10 year old up to a rare 40 year old, and some NAS expressions including the Superstition and the Prophecy. The Superstition expression which I will review, is named after the superstitious nature of the inhabitants of the island. There are some tales that go in the island : the One eyed Campbell, and an aversion of cutting peat until May… The Superstition is a tribute to the people of the island (according to the Jura site). The Expression itself, is a blending of young and older malts (essentially, younger heavily peated malt and older non-peated malts) which are combined into a rather interesting spirit. It’s not an Islay lover’s alternative, as the RMW site claims, but it’s a very solid good dram, with peaty notes. Color: Rich Gold (not sure it’s not artificially colored). Nose: Quite peaty. Not Islay peaty, and medicinal but the peat is there. Smoke can also be detected.On second sniff, I am getting some orange notes as well. i hope that my nose is not off due to the cold I’ve had a few days ago… 🙂 . Finish: The finish is smokey and quite long. The fruit is also there (remember the oranges?). Not bad at all! A very different sort of peaty style. a nice drift from the big medicinal tarry Islays, into Jura land. If you like some subtle peat, than this one is up your alley. It’s not Over complex, but it’s not just about peat in your face. I do think i will have more of this in the future. a Good dram, not excellent, but has quite a unique character to it. Jura style. Price wise, i think it’s logically priced, and is certainly offers a good ROI. Your review seems pretty right on with this one though I did get some coastal notes. I peat is quite strange. I imagine that it was made from dead pricker bushes or nettles, such a strange flavor and feeling. Yes, while it’s not overly complex, it’s not a one trick pony. I think that there’s actually more to this than many of us can detect, hiding beneath the prickers & nettles. Cheers Gal! Great review! i really didn’t get those coastal notes, but maybe my nose was not at top form. its ok to have different notes, from different noses. i’ll try to keep an open “nose” for next time. (that is when i buy a bottle- sample all out). I finished my bottle a few weeks ago. While I liked it, I’m not sure I’ll replace it. I’d really like to try some of the Jura Paps or the aged bottles. I think there’s a 10 & 16yr (plus older ones). Your review seems pretty right on with this one though I did get some coastal notes. I peat is quite strange. I imagine that it was made from dead pricker bushes or nettles, such a strange flavor and feeling. Yes, while it's not overly complex, it's not a one trick pony. I think that there's actually more to this than many of us can detect, hiding beneath the prickers & nettles. Cheers Gal! Great review! i really didn't get those coastal notes, but maybe my nose was not at top form. its ok to have different notes, from different noses. i'll try to keep an open “nose” for next time. (that is when i buy a bottle- sample all out). I finished my bottle a few weeks ago. While I liked it, I'm not sure I'll replace it. I'd really like to try some of the Jura Paps or the aged bottles. I think there's a 10 & 16yr (plus older ones). 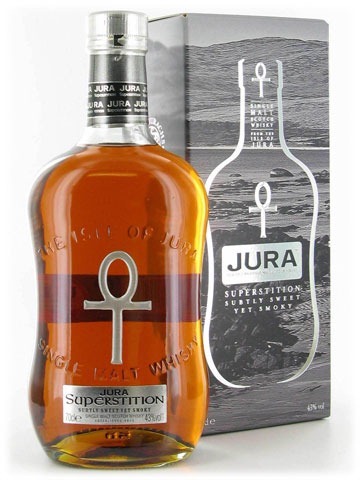 Will there be a Jura Prophecy review soon? I’ve heard that it’s the more peaty one in the Jura family, but as much as I tried, I just couldn’t find a dram in Israel (even in pubs). As to the Superstition, I tasted it once, and it was great. I think you may have underestimated its depth just a little bit (you wrote you were recovering from a cold – perhaps you’d like to taste it once more?). I remember it to have significant citrus notes (both in nose and palate), maybe a bit jam-like (but without the intense sweetness, if I make any sense), a pinch of peat, and there was also something else in there… I can’t quite point to it, but it kind of a smokish thing, but of different kind than that I know from other malts I’ve had. Gal – I too would love to read your notes on the Prophecy! I came back to the Superstition and came up with a different feeling on it than I had the first time I had it but, the Prophecy is a much better dram. Gal, you being a peathead, I bet you’d agree!! I need to get my hands on the Prophecy… I think i reviewed the Jura Boutique XU, which is peatier than all those (30ppm) and I loved it. As for underestimating it, well, it’s been too long, i need to retaste it 😉 got a sample for me? Thanks for the kind words, and yes, i am actually tasting all those dram IN ISRAEL. yes, sir! I have quite a lineup coming in the next weeks/months, up my sleeve… so watch this space. What are your favourite whiskies?